cool photo of that insect - what is it, do you know? She has long egg layer in the rear and very short wings. Brachypterous katydid lay some eggs. What a beauty. I've shared this cool bit o' science with many of the folks here on the ranch. Everyone was quite impressed. Being a farmer is like being a parent. You have to worry about them all the time. When I lived in Jamaica, most of the farmers took to sleeping in their field around harvest time lest their neighbors picked everything for themselves. If you grew the peas from a seed packet and still have the packet read the time to harvest and count back to when the plants came up or at least when you planted. Are the plants flowering yet. They put on a lot of growth before doing either. The more plant, the more flowers, the more fruits, the more to eat. No more to say. You give me hope. I used to drown my plants because I didn't want them to be thirsty. Now I thought I was overnourishing them, but maybe you're right and we're going to have the harvest of all harvest. No flowers yet, but do peas have flowers? I feel so snuggly looking at the pictures of the rain from the truck. 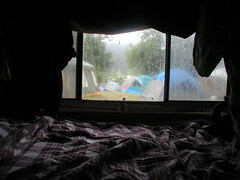 There you are smelling the summer rain, enjoying the mud and the music. But I have a question for you. Why do you have the bean plant tied down with the bungie cords? Is it one of those magical kinds and you want to make sure G doesn´t put it under the giant's house in the clouds and climb up to steal the million dollars under the pillow? Now, I know the meaning of the song from the Beverly Hillbillies when they talk about the Texas T. It means Texas truck! Have fun, I hope you are much better now. G brought the plant from school. We're afraid it will try to go back there if we don't tie it down.